Located near the quaint resort town of Bigfork on the northeast shore of Flathead Lake, this park is 67 acres in size and is 2,900 feet in elevation. A mature mixed forest makes this site very pleasant for camping and picnicking. From spring to late fall the area abounds in wildflowers. Nature walks over the rocky shoreline to the cliffs are popular with photographers for the excellent view of Flathead Lake. The nearby town of Bigfork is known for its Summer Playhouse, gift shops, restaurants, and private resorts. The site offers both flush and vault toilets, a boat sewage dump, RV dump station, public phone, grills/firerings, firewood, picnic tables, trash cans, and drinking water. Golf courses and museums are located nearby in both Bigfork and Kalispell. Camping is limited to 7 days during a 30 day period and no RV/trailer is allowed over 50 feet in length. There are 30 sites on the park, 7 of which are for tents only. Please limit your stay to 7 days. This is a fee campground. 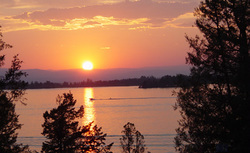 Directions: Flathead Lake is located between Kalispell and Polson on Highway 93 and 95. Wayfarer is located 0.5 mile south of Bigfork on Montana Highway 35.